Both women had the best pairings of high fashion and technology, which was the theme of the event. Claire Danes won the night despite initially being overlooked by many photographers. She wore a dress that wasclassic and very true to Zac Posen’s aesthetic. 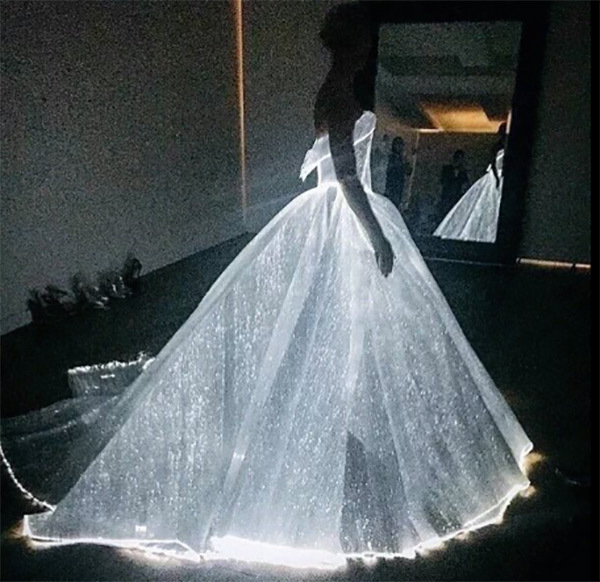 Once she walked inside the dimly lit museum, her gown sparkled and demanded attention. Karolina Kurkova was also very luminescent in a light Marchesa gown. The flowers of the gown glowed different colors based off of Twitter feed, mostly glowing pink with a lot of positive reactions. The people who clearly coordinated, and wore what they imagined as either futuristic or cutting-edge. Willow and Jaden Smith wore two different designers but the use of black and white tied it together. Both wore suits, Jaden in a uniform-style blazer with piping and Willow in a modern women’s pantsuit and coat. Gigi Hadid and Zayn Malik took a literal approach in greys and metallics. Gigi’s metallic bodysuit and Zayn’s metallic armor felt robotic, drawing themes from Hunger Games and Metropolis. Some took a darker turn in fashion and with styling that alluded to a post-apocalyptic future. Katy Perry wore nails, grommets and pendants, which outlined the panels of her dark gown. Her look could be defined as couture steam-punk with her dark lip and round bun. Michelle Williams sported combat boots and a shorter, structured ensemble that were reminiscent of Blade Runner. Jourdan Dunn had a silver, beaded gown. The lines were reminiscent of those seen in art deco, which portray motion and modernism. These celebrities were polar opposite of Perry and Williams, choosing gowns that were lighter in color and more airy. Lily-Rose Depp is a model for Chanel, so it was no surprise that she chose to wear Chanel to the gala. The gown is ankle-length and hand beaded with a floral shawl. The cream colors and textures appear very natural and luxurious. Kate Bosworth’s dress had a highly ornamented bodice and airy skirt. The gown was mostly hand-beaded while the metallics suggested modernity. Blake Lively wore a gown with an embroidered train, overall a look rarely seen from Burberry. The gown had interesting fabrics, most notably the peach translucent fabric that looked like plastic but draped like silk. The translucency also showed her stunning red shoes.